Stella was built in 1998 by Cable Car Classics in Sonoma Wine Country, California. She was originally part of a fleet built for and operated by the Whatcom Transit Authority in Bellingham, Washington. Her sister trolleys are named Annabel, Lucille and Ruby. She is a Golden Gate model with a Cummins 250 hp Turbo Diesel Engine, an Allison B300 World Transmission, and she weighs 20,740 pounds. 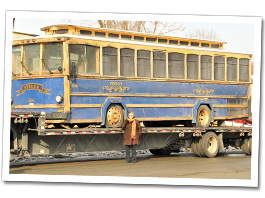 After being decommissioned by the Transit Authority, she sat in a used bus lot for about a year before being adopted by Leslie Masson, the owner of The Peekskill Trolley Company. When all the paperwork was complete, Stella was placed aboard a tractor trailer for the cross-country trip to her new home in Peekskill. At 8:30 am on January 29, 2011, Stella finally arrived in Peekskill. She had just been hauled some 3,000 miles and, according to the tractor trailer driver, it snowed from just outside Washington State all the way to Scranton, Pennsylvania. Stella looked weary from the trip and wanting off that trailer. Unfortunately, she could not be lowered off the trailer; she would have to be backed off onto a loading ramp and then rolled down an unloading ramp. Problem One: There were no such loading/unloading ramps in Peekskill. The next best thing was to back her off onto a flat bed tow truck. 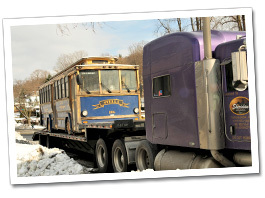 Problem Two: Peekskill didn’t have any tow truck services with a flat bed big enough to handle the job. "Not so fast, Problem Four arose: No one knew how to start her because Stella came without any manuals." The flat bed had to be fifty feet long. Ernst Muller, owner of the North Atlantic RV Center where Stella was to be boarded, called several places and finally found a tow truck company in Brewster that could do the job. So, it was more hauling for Stella, another 25 miles up Route 6 to Lisi’s Towing Service in Brewster. Once there, the first thing that had to be done was to re-inflate Stella’s tires. The air had been removed so she could fit under the overpasses on her cross country trek. Once that was done, we were ready to back her off the trailer onto the flat bed, which was no easy trick as there was less than one foot clearance on either side of her on the trailer. Well, as it turned out, Problem Three reared its ugly head: Stella’s batteries were dead. So now we had to wait for the mechanic with the truck that had the proper charging equipment on it to return to the shop from a road call. About 45 minutes later the mechanic and truck returned. After another half hour or so, the batteries were charged and we were, we thought, ready to roll. Not so fast, Problem Four arose: No one knew how to start her because Stella came without any manuals. After another hour or so after they figured out why she wouldn’t move, we were actually ready to roll. Now, Problem Five: Who will drive her off the trailer? I asked the tractor trailer driver and he said “No way.” Mr. Muller was mulling it over. Finally, Mr. Lisi, the owner of Lisi’s Towing, said, ”Oh hell, I’ll do it.” And, one two three, without any additional issues, Stella was slowly backed off the trailer and onto the flatbed. I was too nervous to watch, so I walked down to the office to pay the bill and prayed as I walked. After paying, I walked back up expecting to jump aboard for the ride back to Peekskill. But I saw Problem Six: The wheelchair lift had been lowered and Mr. Muller and the tractor trailer driver were kneeling down with tools in their hands. I knew that was not a good sign. Apparently, the tractor trailer driver was bored so he decided to sit in the driver’s seat. He wanted to see if the wheelchair lift actually worked, so he pushed the button and to his surprise the wheelchair lift came out. Now he tried to get it back in but was not successful, so they took some parts of it apart looking for answers. None were to be found so they eventually ended up pushing it back in manually. Once in, Mr. Muller got into the driver’s seat as he would be driving her back to Peekskill. He then discovered a button that says “Stow,” so he once again tested the wheelchair lift and this time it came out and then went back in quite easily. Finally we were ready to roll, and Mr. Muller eased her onto Route 6 and off we went. He was immediately impressed with her power and her excellent braking system. 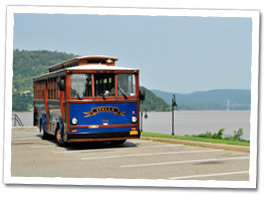 The ride back to Peekskill was fun, with people all along the route waving and taking pictures. When stopped at an accident site, even the fireman and EMS stopped what they were doing and were taking Stella’s pictures. After one more stop for gas, we finally arrived back in Peekskill at about 4:30PM. Stella today after months of loving care and restoration. After 30 years of being part owner and operator of American Dream Promotions, Inc., Leslie was looking for something different to do in her retirement years. After moving to Peekskill in 1995, and falling in love with the city and the area, she knew that she wanted to be part of Peekskill’s effort to become a heritage tourism destination. Hearing Peekskill Mayor Mary Foster say that she thought it would be good to bring trolleys back to Peekskill gave Leslie the idea about acquiring a trolley. After a two year search, mostly on the East Coast, she stumbled upon the site of the NW Bus Company in Washington State, and saw a picture of Stella. She knew immediately that Stella was the trolley she wanted. Transitioning from her life on the West Coast has been smooth for Stella. She has been happily enjoying life here in Peekskill since 2011, and has adapted well to rolling around our fair city and the beautiful Hudson Valley. She has become a very popular alternative to traditional wedding day transportation in Peekskill and the surrounding towns, and she really enjoys helping to make those special days memorable. Stella equally loves taking folks on tours around her home city, and participating front and center in parades and events. She is a bit of a ham, and gratefully soaks up all the attention and adoration she receives. Most of her drivers are veteran school bus drivers, familiar with the area, courteous, careful and responsible. They are all proud and honored to drive Stella, and treat her, and her passengers, with loving care.